Department of Health Special Care Policy recommends "...improving the use of contrasting colours for community equipment, including Grab Rails". To help you meet these requirements we have launched a new range of coloured grab rails designed to provide high visibility and increased contrast. 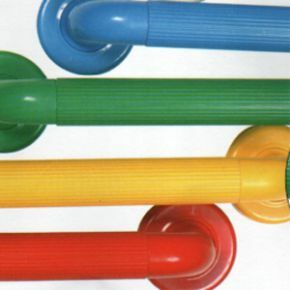 Made from strong PVC tube with moulded end fittings, these brightly coloured grab rails are excellent for added visibility, and the range of different colours available also means that you can select grab rails to match brighter bathroom décor. The round flanges have CAPTIVE covering dishes which clip into place and hide the screws. The flanges have seven holes making fixing to a stud wall much easier. The longitude flutes on the grab rail tubes offer good grip for wet hands. No electrical earthing is required. Great product! Looks great and you don't need to get a electrician to fit and earth which is brilliant.